Aubergines have extremely absorbent flesh that soaks up great quantities of fat when they are pan-fried. You can roast them to achieve a similar effect, using only a light brushing of oil. 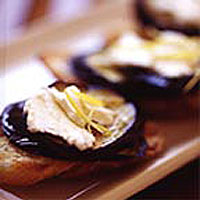 Use these roasted aubergine slices in recipes that call for fried aubergine, or, like here, as an hors d'oeuvre. Using a rosemary-infused oil adds another layer of flavour - you can make your own by gently heating olive oil with a sprig of fresh rosemary for about 5 minutes. Preheat the oven to 230°C/gas 8. Slice the aubergines crosswise into 1cm slices and discard the ends. Using a lightly dampened brush, brush each slice lightly on both sides with the oil and arrange on a large baking sheet. Sprinkle with a little salt and roast until the slices are tender and brown - 20-25 minutes - turning halfway through cooking. When the aubergine has been roasting for around 15 minutes, arrange the bread slices on a baking tray and, with a slightly dampened brush, brush on both sides with the olive oil. Toast in the oven with the aubergine for 2-3 minutes each side, or until golden, then rub with the cut garlic cloves and sprinkle with a little salt. Serve warm with the roasted aubergine. Top with a little crumbled goat's cheese and a few shreds of lemon zest if you like. This recipe was first published in January 2003.